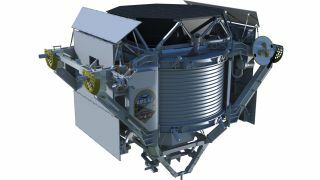 Artist's concept of the Alpha Magnetic Spectrometer, a particle physics detector that will be installed on the starboard truss of the International Space Station. A high-tech astrophysics experiment that will probe the mysteries of our universe is getting ready to fly to the International Space Station aboard the space shuttle Endeavour when it launches on its final mission next month. The Alpha Magnetic Spectrometer (AMS) is a particle physics detector that will primarily measure high-energy particles in space, called cosmic rays, and search for signs of antimatter and mysterious dark matter in the universe. "The most exciting objective of AMS is to probe the unknown – to search for phenomena which exist in nature that we have not yet imagined nor had the tools to discover," said MIT physicist Samuel Ting, a Nobel laureate and AMS principal investigator, March 10 at NASA's Kennedy Space Center in Cape Canaveral, Fla. The $1.5 billion experiment is set to ride up to the space station in the shuttle Endeavour's payload bay. Endeavour's STS-134 mission, the last for NASA's youngest orbiter, is set to launch April 19 from the agency's Florida spaceport. The AMS is currently housed in the Space Shuttle Processing Facility at the Kennedy Space Center. Technicians are completing final preparations before it is stored in a protective canister and then loaded into Endeavour's payload bay on March 25. During Endeavour's stay at the International Space Station, the AMS will be moved to its permanent location on the station's starboard truss. The shuttle and station robotic arms will both be used to transfer and install the 15,000 pound (6,800 kilogram) experiment. While AMS boasts an ambitious list of science objectives, researchers are hoping the experiment surprises them with unexpected results, Ting said. "When you build a new instrument, you ask the best scientists to review it and see what you can do," Ting said. "When you make a discovery with a precision instrument, most of the time it has nothing to do with the original purpose. When you think about it, it's very obvious, because the expert's opinion is based on existing knowledge. To discover something new is to destroy the existing knowledge." The AMS is funded by the U.S. Department of Energy, and its construction, testing and operation involves over 600 physicists from 60 institutions representing 16 countries. Ting and his colleagues have been working on AMS for about 16 years, and gaining approval and funding for the project has been an uphill battle. "The realization of this experiment has not been easy," Ting said. But with Endeavour's launch just over a month away, it marks the end of one long road, and the beginning of another for Ting and his colleagues. What wonders lie ahead? Nobody really knows, said Ting, and like so many experiments that took place on the space station, AMS' findings could one day be an inextricable part of our everyday lives. "To predict the future is very difficult," Ting said. "From discovery to application, there is a time lag – maybe 20, 30, 40 years – but once you use it, you change everyone's lives."